The 8" Gilson Sieve Shaker w/Tapping can hold up to twenty 8in (203mm) half-height test sieves with pan or ten full-height sieves with pan. 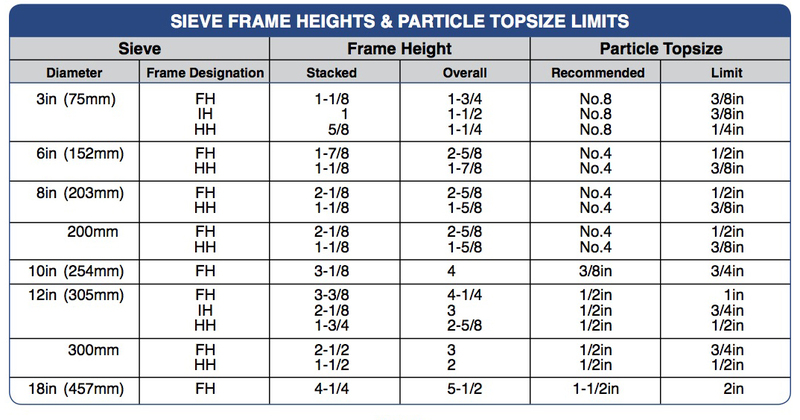 The recommended particle size range is 1in (25mm) to No.635 (20µm). The sieving action of the 8" Sieve Shaker w/Tapping is based on research to obtain sharp, repeatable separations quickly over a broad range of particle sizes and material types. The exclusive action results from perfect circular rotation of the sieve stack and vertical two-way tapping at 48 taps per minute. Circular rotation is superior to inefficient back-and-forth actions that create “dead spots” and prevent complete separation. Particles roll in all directions relative to the pattern of woven sieve mesh. “Up” taps mix, reorient, and redistribute particles to present new orientations to sieve surfaces. “Down” taps assist in passing near-size particles to clear the mesh. These high-capacity shakers can hold as many as twenty sieves, depending on model and sieve frame dimensions. The built-in precision digital controller features push-button start, and resets desired test time automatically for exact repeatability up to 99 minutes, 59 seconds. A pause function allows the cycle to be suspended and resumed with no loss of test time, and a five-second audible alarm sounds at completion of the interval. The controller is simple to program and the large, bright 1/2in (13mm) LED display is easy to read. Easy to operate new EZ-Clamp system with integral sieve cover slides freely up and down the clamp rods with the push of a button. Once in position, simply release, then a quick twist secures the lid on the sieve stack. Once the test is complete, raise just enough to remove the stack. The clamps stay in place, ready for the next test without readjustment. The internal counterbalance system promotes stability during operation without the need for permanent mounting. The unit can easily be relocated, using the adjustable footpads for leveling. This Sieve Shaker is housed in sturdy painted steel cases and powered by 1/3hp electric motors. Sieves and accessories are ordered separately.